Two of the oldest and most profound healing strategies known to man are fasting and consuming bone broth. While each of these strategies has amazing benefits used alone, combining these two ancient healing strategies is a fantastic way to intensify and expand their health benefits. Bone broth is a healing elixir made from simmering the bones and connective tissue of a animals and/or fish. Healing compounds like collagen and the amino acids proline, glycine, arginine, and glutamine are released into the liquid as the bones simmer. In addition to these anti-inflammatory compounds, bone broth contains bioavailable minerals to replenish nutrients in the body. Fasting with bone broth is one of the most transformative, healing strategies you can implement. It is a fantastic way to improve your health at a deeper level. Bone broth is often referred to as “liquid gold”. This is because bone broth is a nutrient-dense, easy to digest, healing tonic. It contains many beneficial compounds and nutrients including bioavailable minerals. There are many minerals in bone broth. These minerals are easy to absorb and include potassium, selenium, calcium, magnesium, sulfur, phosphorus, and silicon. This healing broth also contains glycosaminoglycans (GCGs), a group of carbohydrates that support and maintain collagen. Bone broth is an excellent source of amino acids. Amino acids are the building blocks of protein and play many critical roles in the body. The amino acids in bone broth include arginine, glycine, glutamine, and proline. These amino acids contribute to bone broth’s healing properties. Bone broth is one of the best sources of collagen. Collagen is the most abundant protein in our bodies. It is a structural protein and gives bulk, shape, and support to bones, blood vessels, and organs such as the heart, kidneys and liver. Many of the benefits of bone broth are due to the collagen content. Collagen is the intracellular “glue” that holds your body together by forming connective fibers in tissues such as skin, ligaments, cartilage, bones and teeth. For more information about collagen and the reasons collagen improves your health, check out this article. 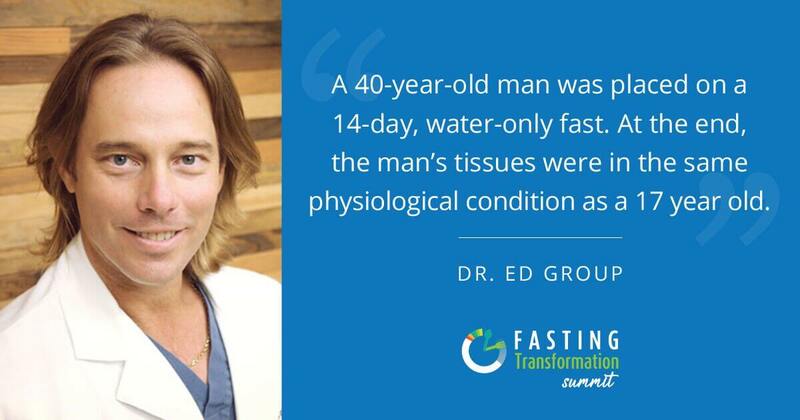 Fasting is one of the oldest and most powerful strategies available for healing. 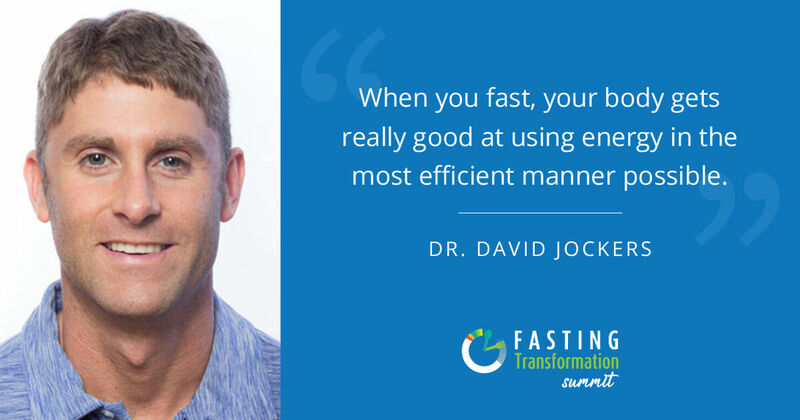 With fasting, you go without solid foods for a certain length of time. The period for fasting can be 12 hours to several weeks, depending upon your health goals. One of the great things about fasting is that there are many ways to incorporate it into your lifestyle. You can do intermittent fasting for a short period each day to extended water fasting for weeks, and there are many variations. Intermittent fasting is fasting for a certain period during the day. It is divided into the building or feeding window when you consume foods and the fasting or cleansing window when you are going without food. Studies have found many health benefits from intermittent fasting (1). 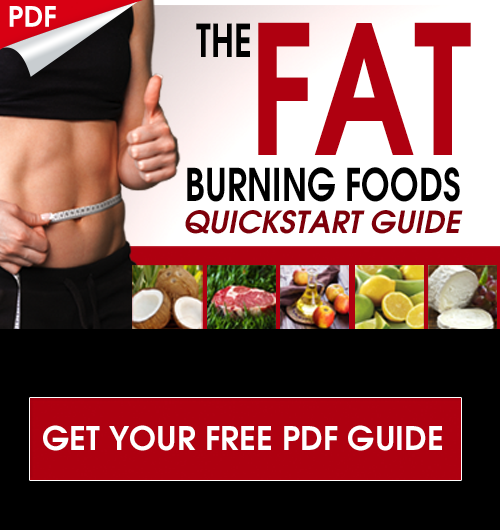 For more information on the best intermittent fasting strategies and how to fast, read this article. Extended fasts last for over 48 hours. 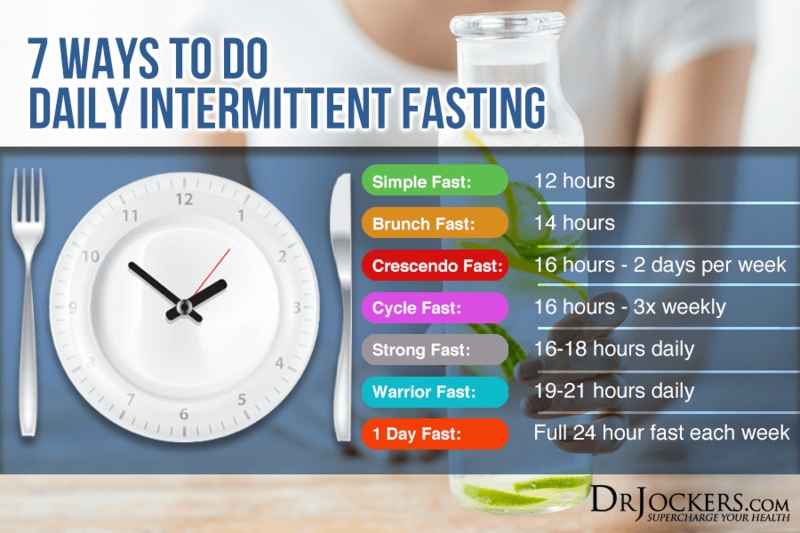 Extended fasting yields greater health benefits than intermittent fasting because the body can heal and repair cells, tissues, and organs at a higher and deeper level (2). 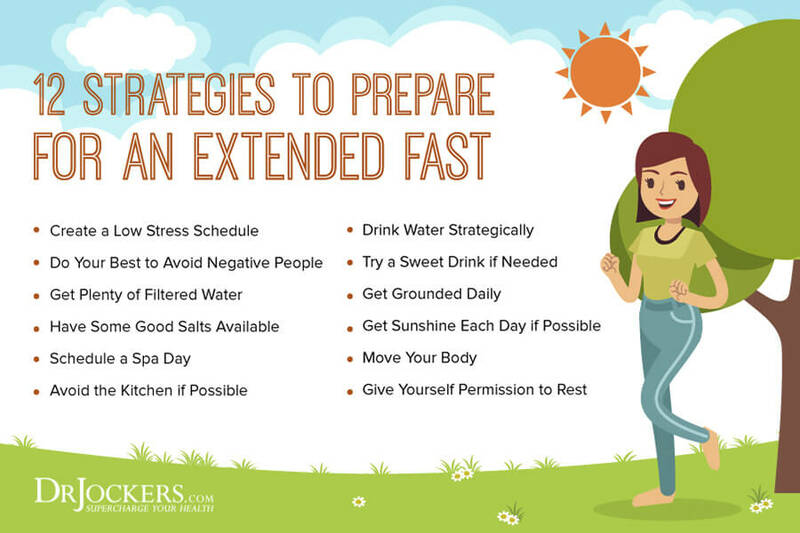 Extended fasting is a powerful healing tool you can utilize for a quick health transformation. If you are interested in implementing an extended water fast, you should read this article to help you properly prepare. For the best way to break an extended fast and reintroduce foods properly, check out this article. Bone broth fasting is a partial fast. Partial fasts include small amounts of calories from certain foods. With partial fasts, the calorie load during the fast is around ¼ of a person’s normal daily calorie intake. 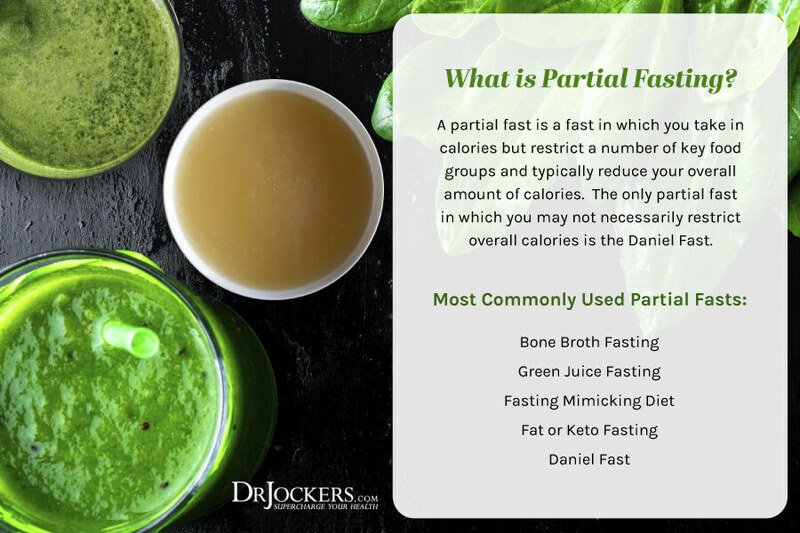 In addition to bone broth fasting, green juice fasting, fat fasting, keto fasting, and the Fasting Mimicking Diet are examples of partial fasts. Let’s look more closely at the benefits of bone broth fasting. A great way to fast is with bone broth because of its rich array of minerals, electrolytes and amino acids. With bone broth fasting, you abstain from solid food and just consume bone broth and water. One of the main health benefits of bone broth is its ability to repair and heal the gut. 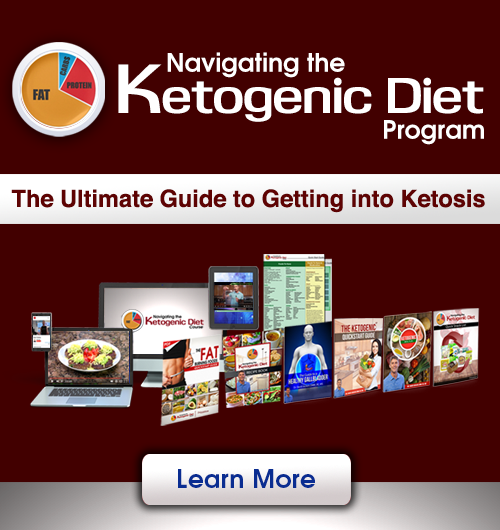 Many people suffer with a leaky gut due to the modern Western diet and lifestyle. The high amount of sugar, processed foods, GMOs, alcohol, antibiotic usage, etc. 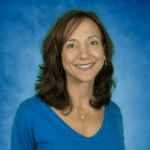 are all extremely damaging to the gut and can result in leaky gut syndrome. Leaky gut syndrome, or intestinal hyperpermeability, is a condition in which the tight junctions in the gut lining become too large and abnormally permeable. Undigested food particles and toxins can pass through these holes in the intestinal wall and into the bloodstream. This causes the immune system to overreact and results in chronic inflammation and food sensitivities. Bone broth is rich in collagen and the amino acids proline, glutamine, glycine and arginine which help to heal the tears in the intestinal lining and support a strong gut lining. As the gut heals and the immune response stabilizes, food sensitivities can improve. Fasting with bone broth can speed up the healing process. Digesting solid foods creates significant stress on the digestive system, irritates the gut lining, and leads to inflammatory processes. With bone broth being easier to digest, our bodies can conserve the energy used in digesting, processing and assimilating solid foods. Instead, the body can use this energy for healing and detoxification. Bone broth contains many compounds that are great for your joints, tendons and ligaments. Perhaps the most important is collagen, which is critical for healthy joints. Collagen is gel-like and smooth, helping our joints move more easily. Ligaments and tendons, the connective tissue that attach and hold together bones and muscles, are made of collagen. Collagen also supports the body’s ability to produce chemicals that naturally support healthy joints. Bone broth contains glucosamine, chondroitin sulfate and hyaluronic acid. Hyaluronic acid lubricates and cushions joints, serving as a “shock absorber”. Glucosamine and chondroitin are structural components of cartilage, the tissue that cushions joints. These compounds in bone broth support healthy joints and the body’s ability to build and repair cartilage. A bone broth fast is a powerful strategy for reducing joint pain and for repairing and strengthening your joints, tendons, and ligaments. Bone broth is incredible for healthy skin and hair. Incredibly, 70% of the protein in your skin is made of collagen. The collagen in bone broth can help maintain your skin’s texture and appearance. It can even reduce visible signs of aging and reduce appearance of stretch marks and cellulite (3). Collagen helps form elastin and other compounds within skin, improving skin elasticity and skin moisture (4). The hyaluronic acid in collagen holds water and forms a gel-like substance that hydrates the skin and hair. Collagen has the unique ability to help renew and repair cells, which is important for good skin integrity. Collagen is essential for healthy hair. Collagen is part of your hair follicle stem cells, which help create new hair. The collagen in your hair also gives it structure and healthy bounce. When you are deficient in collagen, this can trigger premature hair loss and make your hair weak, brittle, and dull. A bone broth fast can help to optimize your level of collagen which is important for healthy, radiant skin and hair. Bone broth fasting supports a healthy metabolism and can help you lose excess weight. The collagen, glucosamine, chondroitin sulfate, hyaluronic acid and key electrolyte minerals all contained in bone broth provide fantastic support for a healthy metabolism. The glycine in bone broth helps form muscle tissue by converting glucose into energy to feed muscle cells. The amino acids arginine and glutamine also support metabolism. Arginine boosts metabolism by supporting the body’s ability to make protein from other amino acids. Glutamine provides carbon and nitric oxide which are important for building and maintaining muscles (5). Glutamine also provides fuel to our cells to maintain energy levels. Another benefit of bone broth is that it stimulates the release of satiating hormones into the bloodstream which can help reduce appetite. The amino acids in bone broth can help to reduce sugar cravings. On top of that, the low calorie intake and low-carb intake helps to reduce insulin. Lower insulin levels helps stimulate fat burning mechanisms and can help you lose excess weight. Every day, our bodies are bombarded with toxins. Toxins are found in the foods we eat, the air we breathe, the products we use, and the water we drink. With continual exposure to toxins, your immune system and liver can get overwhelmed and weakened. Your immune system is the first line of defense against toxins. It is part of the body’s natural detoxification system. Toxins create free radicals which damage immune cells resulting in chronic inflammation. The liver is the primary organ for detoxification. It filters toxins and transforms them into compounds that can be excreted from the body. 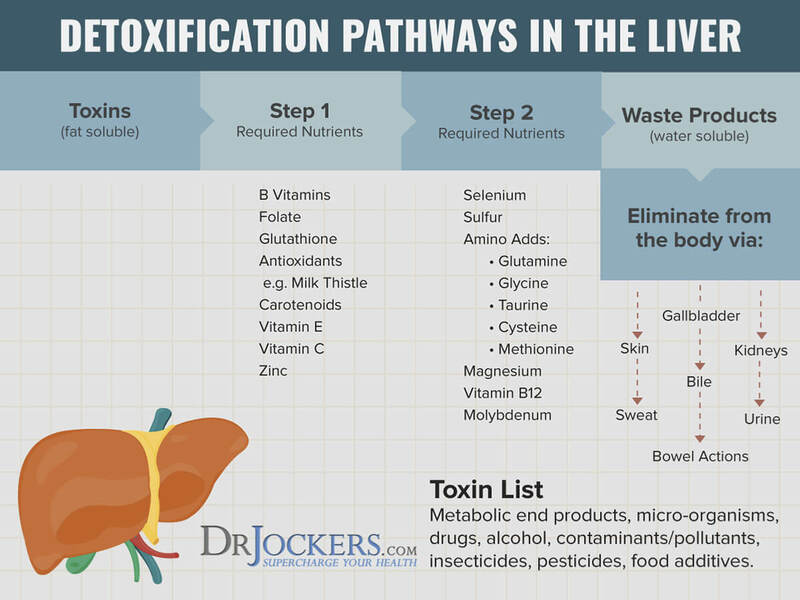 As you are exposed to more and more toxins, the liver’s ability to detoxify can be weakened. This can result in toxins being stored in our tissues and cells rather than eliminated causing further damage to the body. Bone broth is rich in sulfur, selenium, and glycine which help with phase II liver detoxification. The glycine found in bone broth helps to produce glutathione, the body’s master antioxidant. Glutathione neutralizes free radicals, enhances the immune system and detoxifies the liver. Bone broth also contains bioavailable minerals which act as chelators to remove toxins from the body. What Bone Broth Should You Use on Your Fast? The quality of the bone broth that you use on your fast is very important. You should only use top-quality bone broth. 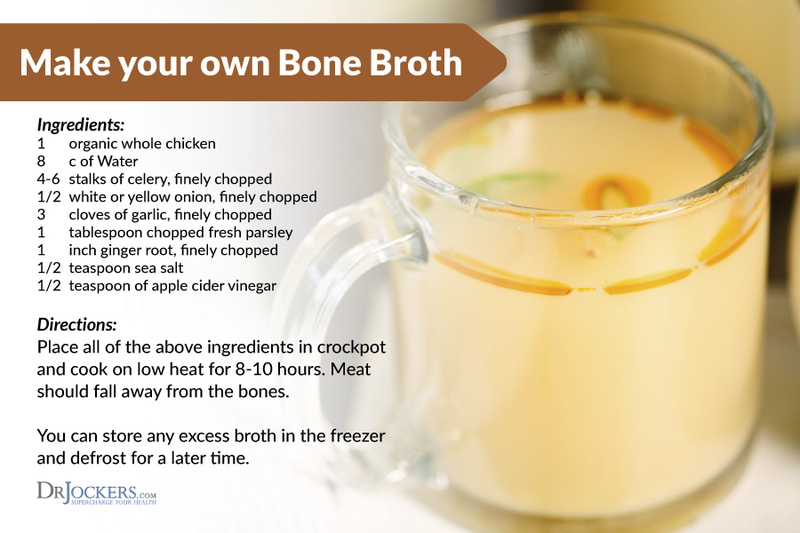 There are several options for bone broths: homemade bone broth or premade bone broth in liquid or powdered form. The best bone broth is the broth that you make at home. You should simmer the bones and connective tissue for at least 10 hours. The longer it is simmered, the more collagen is released. Bone broth can be made from any animal with bones, including fish, chicken, turkey, beef, lamb, bison and venison. The bones and connective tissue should be from organic, grass-fed animals or wild caught fish. Knuckles, chicken feet, and femur bones contain the most collagen. Organic vegetables such as celery, onions, and garlic can be used in your bone broth, along with herbs like parsley, rosemary and thyme. Vegetables and herbs have healing properties and can add great flavor to your broth. You should use filtered water and add apple cider vinegar to help pull the nutrients from the bones and tissue. There are many commercial bone broths available. Premade bone broth comes in both liquid and powdered forms. 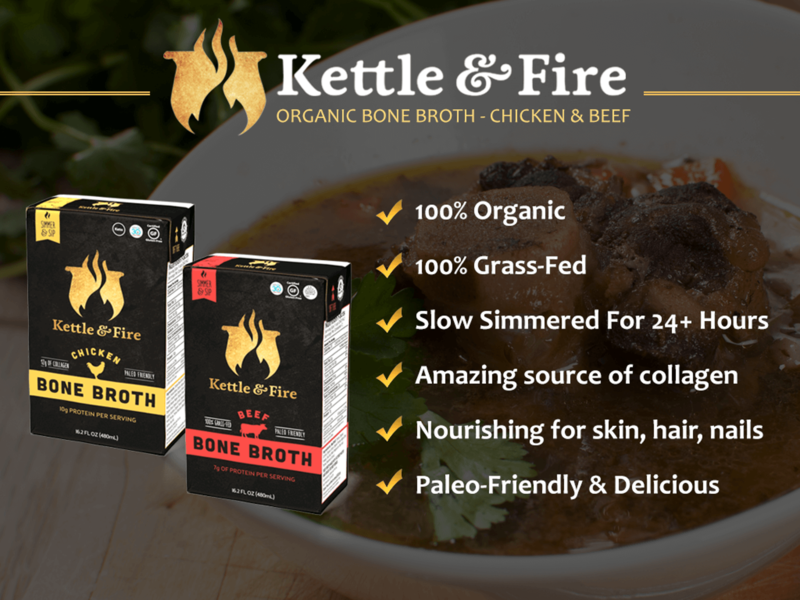 My favorite brand of liquid premade bone broth is Kettle & Fire (here) which I have found to be the very best on the market. The reasons why I love Kettle and Fire is that they only use 100% organic and grass-fed animal bones for their broths. This is especially important as these animals are not exposed to pesticides and herbicides and do not bio accumulate a high toxin load. Additionally, Kettle and Fire uses a slow simmering process to help extract the maximal amount of minerals and collagen from the bones. My family loves the flavor of their bone broth and we use it on a regular basis. In fact, Kettle and Fire was the first “food” we introduced to our little daughter Joyful when my wife was unable to produce enough breast milk to meet her needs. You can also get powdered forms of bone broth collagen protein. This is beneficial because you can easily stir it into a variety of dishes and protein shakes. My favorite powdered form is the Ancient Nutrition organic bone broth collagen protein. I regularly use the powdered form in smoothies and shakes to get more of these key nutrients, but should only be mixed with water during the fast. We carry organic bone broth collagen protein in sugar-free vanilla, chocolate and pure flavor. Never use bones from conventionally-raised animals or farmed fish. These animals are exposed to hormones, antibiotics, pesticides, herbicides, and other toxins. Drink your bone broth from glass, not plastic. Plastics have toxic xenoestrogenic chemicals that can damage your body. These chemicals can leach into your broth. Drink 24-48 oz of broth each day on your bone broth fast. Most people will do 3-7 days on the bone broth fast. Keep exercise gentle with light walks. Do not exercise vigorously during the fasting period. You may feel weak during the first few days of a fast as your body cleanses and heals. Set aside extra rest time during the first few days. Work with a health practitioner who can guide you. In addition, this image below goes over some additional strategies to apply in preparation and while you are going through any sort of fast. You can read more about fasting preparation in this article. Bone broth fasting is a fantastic strategy for the majority of people. It is high in histamines and free glutamates which most people can metabolize well. However, if you have a histamine or glutamate intolerance, you may struggle with bone broth. You can read more about histamine intolerance in this article. Histamine is an inflammatory molecule that helps regulate immunity. An individual with histamine intolerance has an exaggerated reaction to high histamine foods (such as fermented foods and beverages, vinegar, cured meats, soured foods, citrus fruits, dried fruits, aged cheeses, nuts, and processed foods) or foods that produce histamine (such as alcohol, cow’s milk, avocados, nuts, and bananas). 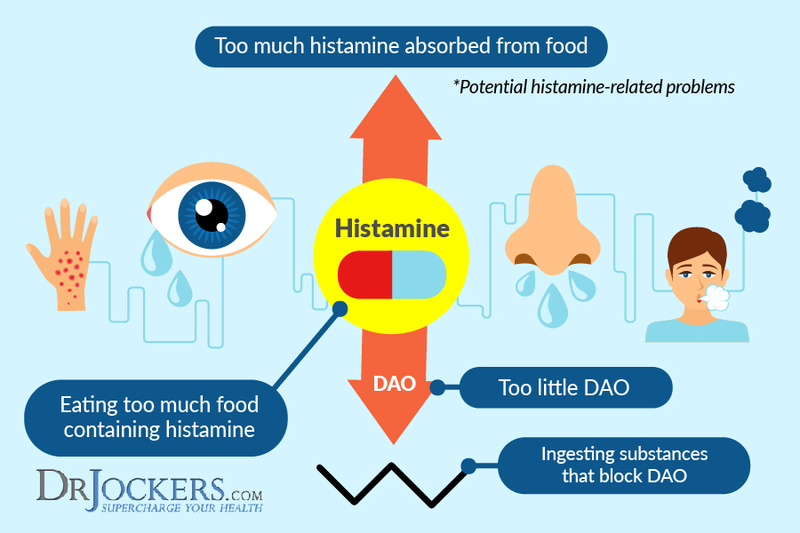 The causes of the exaggerated reaction to high histamine foods could be insufficient DAO enzyme production (needed for proper histamine metabolism) or elevated histamine levels. If you are intolerant to histamines or glutamates, bone broth fasting may not be a good option for you. Bone broth fasting combines two powerful healing methods into a fantastic strategy for improving overall health. With bone broth fasting, you consume bone broth and water and abstain from solid foods for a period of time. Bone broth is an incredible healing tonic with many beneficial compounds such as collagen, amino acids, glycosaminoglycans, and bioavailable minerals. Fasting has many health benefits including reducing inflammation, stimulating the development of stem cells and cellular autophagy, improving insulin sensitivity, reducing the risk of chronic disease and much more. Fasting with bone broth may improve your health in many ways. It helps to heal the gut, improve digestion, and reduce food sensitivities. Fasting boosts these benefits by giving your digestive system a break from the stressful process of digesting foods. 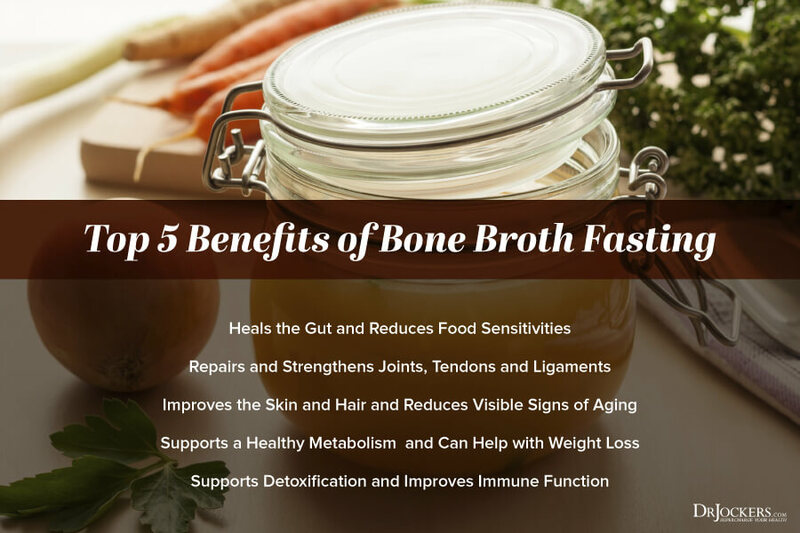 Bone broth fasting repairs and strengthens joints, tendons, and ligaments, and improves your skin and hair while reducing visible signs of aging. It supports and healthy metabolism and helps you to lose excess weight. Additionally, bone broth fasting supports detoxification which can boost your immune system. Doesn’t bone broth halt autophagy? I use it to break a fast but not during fasting itself. Yes it will limit the amount of autophagy. However, it is a fantastic way to heal the gut and is less stressful for the body than a water fast. So it is a good partial fast to improve one’s metabolic flexibility before they may be able to tolerate a longer extended water fast. Thank you. Good to know. As usual, a very interesting and informative article. Hi, for a SIBO bone broth I’ll be using marrow bones without knuckles & cartilage, and using an instant post for less than 3 hours due to antihistamine protocols. Can I reuse these same bones again to make another batch of bone broth atleast 3 times? Yes you can try that out! My new Instant Pot cooker has feature for pressure cooking bone broth in 2-3 hours as opposed to 10-12hrs. Do you have thoughts opinions or statistics regarding the quality of bone broth prepared in a pressure cooker in a shorter time? I think this is good quality broth when it is in the Insta Pot. Beef bones should be cooked for a full 24 hours but chicken is great at 12 hours.